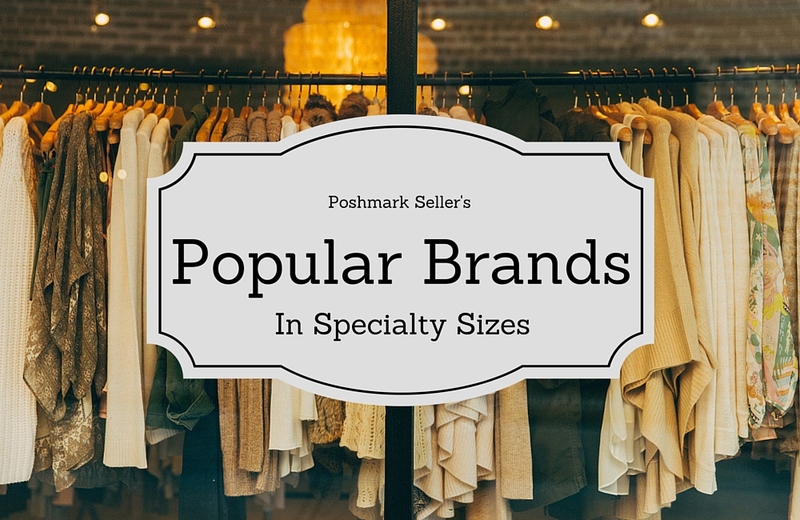 In April’s trend report, Poshmark announced their new extended sizes feature. Instead of having to manually enter a size other than S-XL and numbers, we can now label sizes as Plus, Petites and Juniors. Here are some of the most sought-after brands right now in these size categories. These are the brands that buyers are actively searching for in Poshmark. If you have any of these pieces sitting around, get them listed ASAP! Boohoo Plus Most active listings range from $20-40 with sales at about $20. There aren’t many listings yet for this brand, but it is being searched for by buyers. You will have a good chance of standing out and making a quick sale with this brand. Paige Jeans Listings vary widely from $15-200 depending on rarity and condition. While a few listings have sold for over $100, the majority of sales are happening at under $50. Banana Republic Banana Republic is pretty saturated on Poshmark, but it is still very in-demand. Prices vary widely depending on the item. Higher-end listings over $100 may stand out more, but the majority of sales are going to lower-priced items. Ann Taylor Of this group, Ann Taylor has the most active and sold listings over $100. American Eagle Active listings are between $5-60 and most sales above $25 are for jeans and jackets. Blackmilk Most listings are in the $50-100 range with sales going for $25-50. This brand has sold A LOT of listings. For highly saturated brands, how do you get your listings to stand out? To start, make sure that you have spelled the brand correctly on your listing. Poshmark lets you select known brands as you start typing them, so tapping on Poshmark’s brand suggestion when creating your listing is often the safest thing to do. Take high-quality photos with good lighting. Check out my previous blog post with my recommendation for an affordable lighting kit. I use it myself and it has made a huge difference in being able to capture the details of the clothes I’m photographing. Also, share your relevant listings to the morning parties. The first party of the day is always for a handful of brands picked by Poshmark. Don’t try to cheat and edit the brand just for the party if your item is something else. If you accidentally make a sale, then that will be a valid reason for the customer to make a return. If you happen to have a lot of clothes in one particular brand (or have access to get them cheaply), consider curating a brand-centered closet. Create a few informational listings about how to pick your size in that brand or how to spot authentic versus fake items. If you are seen as an authority on the brand, buyers will remember your closet and will probably check out what you have first before turning to a broad brand search. This is a very well done site! I like the layout and feel you have put into it. I have to admit that I hadn’t heard of Poshmark before now. I asked Carla, my wife, if she had heard of it, as she is an avid clothes bargain shopper; but it was new to her, too. So, without a doubt, you are providing valuable information by sharing your experiences and reviews of this online service! If you are interested, Carla and I have just launched a brand new website called: TinyHousesForAll.com which is dedicated to people who want to have their own tiny house and homestead. Thanks for stopping by! I’ve loved both buying and selling on Poshmark. I feel like every time someone asks where I got something, my response is always “I got it on Posh!”. There are some seriously good deals to be found on there. I’ll definitely check out your site on tiny houses. I was actually just having a conversation with my sister-in-law about them this evening! Hey Kiersten! Thank you so much for all the work you do to help others better understand the Poshmark community. I have a question for you from a seller’s perspective. I sold an item, that was $150, shipped the item with my Poshmark provided label, paid for the overweight at the post office, and it should have arrived via 1-day priority mail. I used my Poshmark shipping label, asked the USPS attendant to only use the Poshmark tracker, however usps put a second tracker on it when I paid the extra $2 for the overweight at the store. Per the Poshmark tracker, this item was delivered and is pending acceptance! However, per the buyer it has not arrived. It was shipped and arrived within five days. The customer ordered on a Sunday, I said I would ship Tuesday and I let her know I was unable to ship tuesday, apologized for the delay, and shipped it Wednesday night. Package went out Thursday and arrived Friday per the tracker. However, the second tracker said it is still in transit. How can two trackers on one box have conflicting trackers?! Who knows! Importantly, the Poshmark tracker says it was delivered. I feel as though USPS would not mark something delivered if it was not! I think they likely didnt scan the second tracker. I called Usps, they are helping me and the two trackers are documented as linked on one package. Anyways, the buyer keeps commenting on the listing, as though I have control over the USPS and this is my fault. I submitted an email to Poshmark inquiring about the package and the buyers claim, and explaining I am now uncomfortable. I understand I shipped it later than I said I would, however it was still shipped and arrived within five days. I have had 5 star ratings on every single sale thus far (knock on wood) and have sold over 50 items. This was my highest sale yet. That stinks when things go awry with shipping! You definitely did the right thing by emailing Poshmark support and explaining the situation. Since you shipped the package and have proof of that as it was scanned it, then I would assume that the burden lies on either Poshmark or USPS. I really hope the package does show up. However, if it somehow got lost, then I would hope that Poshmark would release your funds to you and also refund the buyer. Then they can file a claim with USPS. I haven’t heard of this happening before and I really hope it ends up working out for everyone.